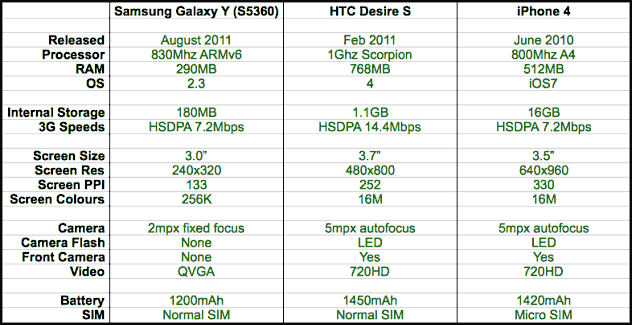 I love my iPhone 4, but how does it stack up against similar spec’d Android handsets. Sleek looks are very nice, but it’s performance that counts when in the real world. 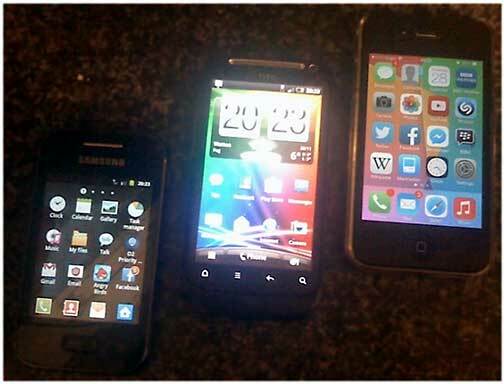 In this article, I compare my iPhone 4 to my son’s budget Samsung Galaxy Y S5630 and my wife’s HTC Desire S. Here at Low End Mac we rarely use cutting edge devices, so I take a look at these three handsets from a few years back. As you can see, the iPhone 4 has similar specifications to the HTC Desire S, with the HTC being ahead in both processor and RAM. The iPhone 4S with its dual-core processor and improved graphics chip might have been an unfair comparison. This whole article was sparked off after I was playing with my son’s Samsung Galaxy Y and was astonished at how fast this cheap handset was, despite costing me a tenth as much as my iPhone 4. This is not a comparison of the operating systems. For me Android just doesn’t compare to iOS, but that is personal opinion. There is nothing wrong with Android; I just like look and feel of iOS – its home screen, the lack of widgets, and its “some might say boring” unified look. Being a Mac user, I also like the way iOS fits with OS X.
I ran seven tests on all three handsets, starting with a boot test to see how long it took to boot from being off and a camera test to see how quickly the camera would launch. Next I ran some apps and games, Facebook, SpeedTest by Ookla, Google Maps, the App Store on the iPhone and Google Play on the android handsets and finally Angry Birds. This should be enough to push the processor, RAM and graphics capability as well as checking out network speeds. Wifi was turned on and connected on all three devices. We have some pretty interesting results there. The dark blue indicates the best time. This entry level budget Android Samsung Galaxy Y performed very well in the app tests, but its low RAM and graphics power let it down in the gaming stakes. Angry Birds took five times longer to load, but it was perfectly useable once loaded. With only a 2 megapixel fixed focus camera and no flash, it isn’t going to win any awards in the imaging stakes – and no front facing camera either. This is purely enough for snapping and uploading to Facebook or Twitter, which it did quite smoothly and quickly. It is, however, running an older version of Android. Gingerbread 2.3.6 is now a fair few revisions behind – released in September 2011 – but is still being sold on some budget phones. The Samsung TouchWiz UI on top of Android feels a bit childish but suits the small phone. It is a compact handset, and its 3” screen is useable (I used to have an Android with 2.5” screen), but its painfully low resolution screen with its paltry 256 thousand colours makes it look terrible. The overall feel of the handset feels cheap, which of course it is. Despite its cheap feel and budget price, it does offer enough speed to keep you from getting annoyed with it. Social networking on it is very fast, as is the browser. Call quality is great, but the keyboard can feel a little cramped on the small screen and offers no feedback. My wife’s HTC Desire S is a very powerful beast and miles ahead of the Samsung. Its 1 GHz Snapdragon processor coupled with 768 MB RAM gives this handset some serious grunt. It is currently running 2.3.6 too but is capable of officially upgrading to Ice Cream Sandwich 4.0.4 released in March 2012. It handles 2.3 very well, but 4.0 is supposed to be a little heavier. HTC put their Sense interface on the Desire S. personally I don’t like it, but it works very well, and my wife gets on with it. The 3.7” screen with 16 million colours offers a very nice looking display, with the onscreen keyboard feeling a lot nicer to type on. It took an incredibly long time to boot,* but once up and running, loading apps was very fast – apps were marginally slower to load than the iPhone 4 with the exception of Google Maps, which opened within seconds. The UI is fantastically fast, maybe due to it still running Gingerbread. * Update: A reader pointed out there is a fast boot option in the Settings menu on HTC phones. This will resolve the long boot problem, making it boot in under 20 seconds, although next to the option there is a warning that some apps may not like it. It has a great 5 megapixel camera with autofocus and is capable of 720p HD video. There is a front facing camera too, and the 1450 mAh battery keeps it going very well and easily lasts a day or two without breaking into a sweat. My beloved iPhone 4, with its glorious sleek design, glistening silver Apple logo, and awesome iOS, comes under some pressure when pitted against these two Android handsets. With slightly lower specs than the Desire S – featuring an 800 MHz A4 processor and 512 MB RAM vs. the 1 GHz Snapdragon processor and 768 MB RAM in the Desire S, the iPhone 4 is on a slightly lower footing. However, its high res 3.5” 640 x 960 pixel 16 million colour display cramming an awesome 330 PPI pixel density makes the screen ultra crisp and easily outshines the HTC. The 5 megapixel autofocus camera with LED flash is capable of 720p high definition video, and its front facing camera matches the Desire S in the camera stakes. Being an iPhone it, lacks a card slot for additional storage, but it does come with 16 GB built in storage (also available in 8 GB and 32 GB). The iPhone 4 is running the latest offering of iOS, iOS 7 released September 2013, and considering its lower processor and RAM than the Desire S, it beat it on all accounts except the camera and Google Maps. The loading times are not immensely faster than the Desire S, and I can’t help wonder what it would be like on iOS 6 (released September 2012), which is lighter and faster than iOS 7 on the iPhone 4. The 1420 mAh battery on the iPhone 4 lasts 24-36 hours under iOS 6 and iOS 7 with average use. iPhones command a high price – often referred to as “the Apple tax” – be it new or used, and you would expect that to be reflected in performance, but it just isn’t so. A new iPhone 4 in the UK costs around £200*. A used iPhone 4 in the UK costs around £140. A new Desire S in the UK costs around £100. A used Desire S in the UK costs around £65. A new Galaxy Y in the UK costs around £65. A used Galaxy Y in the UK costs around £25. Considering the big price difference between them all, their isn’t a huge advantage. Okay, so the Galaxy Y has a rubbish screen and poor camera, but if you want a cheap phone for Facebooking, it is a good handset for its price. The Desire S has a great look and technically outpowers the iPhone 4 for less than half the price, and if operating system doesn’t bother you, you get a lot of bang for your buck. However, if you are an Apple and iOS fan, you will have to pay the premium price for that shiny Apple logoed product. The Galaxy Y is good value for money if you want a cheap smartphone or perhaps a youngster stepping into the mobile world, and while the iPhone 4 edges ahead of the Desire S, the price difference is huge. Considering the iPhone 4 has lower specs than the Desire S and is running a 2013 operating system, I think the iPhone 4 wins, but not by a huge margin. If I weren’t hooked into the Apple ecosystem, I would consider an Android. * estimated cost, as I couldn’t find anyone selling a new iPhone 4. I wonder how the iPhone 4 would have compared if still running iOS 4 or 5? As you even noted in the case of the desire s, the later versions of an os tend to be heavier for older hardware. I wonder how they would comapare on an even footing on that front. Interesting article Simon, though there are quite a few areas where Android handsets fail other than the hardware. Case in point is the API’s the OS gives to programmers. Up until Android 4.x there was little access to the graphics chip, which left the CPU to do pretty much all the work and the GPU underutilised. A good example is Angry Birds on the iPhone 3G compared to the Galaxy Ace, similar generation phones but the Galaxy Ace has a CPU almost twice the speed of the 3G, yet games like Angry Birds, Orbital, Jetpack Joyride all run incredibly smooth on the 3G but are noticably jerky or just downright slow on the Ace with a CPU almost twice as fast. iOS in all its forms gets right to the hardware and gives as much access as needed, which is why the OS appears as smooth as it does. Because a decent set of API’s were there, other apps have good access to the hardware without bothering the CPU too much or needing the OS too much. Failure to do this on the earlier Androids made things difficult but with proper API implementations in Android 4.x, the playing field is a lot more level. The higher end Android phones have easily caught up with Apple in terms of hardware and yes the OS is more customisable, but I personally don’t like it though I understand why many do. The Ace is ok for what I need it for, but as a phone or a games machine it is pretty poor. If it were not for the engine diags software that I use, I would not have it at all.